Chinese politics from the provinces: In Nanjing, Will The Usual Strategy To Fight Corruption Be Sufficient? In Nanjing, Will The Usual Strategy To Fight Corruption Be Sufficient? 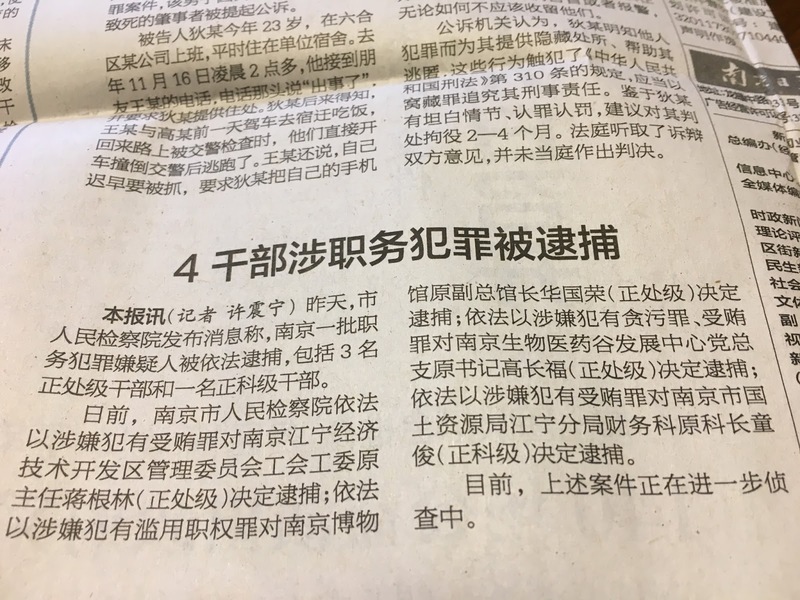 Four officials in Nanjing were arrested here this past weekend on corruption charges, specifically suspicion of bribery [犯有受贿罪] and “committing crimes while on duty” [职务犯罪]. While it’s an interesting group of suspects, the news also points to the differences between how Beijing is tackling corruption and what Nanjing is doing about graft. But first, here’s the lineup of the accused. There’s Jiang Genlin [蒋根林], the former director of the Trade Union Management Committee in Nanjing’s Jiangning Economic and Technological Development Zone [江宁经济技术开发区]. The former deputy curator of the Nanjing Museum, Hua Guorong [华国荣] is also in custody for abusing authority [滥用职权罪]. He had been a high-profile administrator in the museum’s recent expansion but his impressive resume has suddenly gone missing from their website. Also detained is Gao Changfu [高长福] suspected of corruption and bribery while working as Party Secretary in charge of Nanjing Biomedical Valley Development Park [南京生物医药谷]. At least one can still find his political climb online and a news item from 2016. But he’s likely not to be so available to the local media, at least for a while. The final member of this local Gang of Four is Tong Jun [童俊], the former chief of the Finance Department of the Jiangning branch of Nanjing’s Bureau of Land and Resources Bureau. Tong isn’t the first person connected with property allocation decisions here to be pulled in for clever questioning about how certain developers received rights to land that was supposed to be publicly auctioned. It’s unlikely he’ll be the last. A former trade union director, a museum administrator, a local party secretary, and a finance department chief--that’s a diverse collection of the purportedly corrupt. Were they all linked in some scheme? Or are each the masterminds behind separate efforts to defraud? And if they’re guilty as charged, how could they not know that they’d get caught? Because it wasn’t as if they weren’t warned: They were. In fact, while Nanjing party media have been reluctant to rebroadcast at high-volume everything that the 19th Party Congress decreed, officials here know that they have a corruption problem and Nanjing authorities have recently warned cadres and bureaucrats of even greater supervision in 2018. But, depending on whether one is speaking of Beijing or Nanjing, there are different strategies in place to fight corruption. 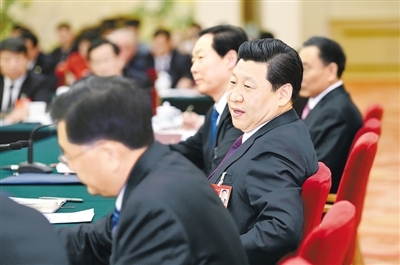 In Beijing, President Xi Jinping has, to quote central party organs, “come out swinging again” [再出重拳] against graft. There’s a renewed focus on the use of public funds for personal consumption, and in recent months, that’s “snuck into the underground and tried to assume invisible forms” [潜入地下的隐形变异] . Because officials are getting better at hiding corruption, an even more ruthless campaign must commence—at least according to Xi and his comardes in Beijing. But Nanjing is seeking to wage its war differently. 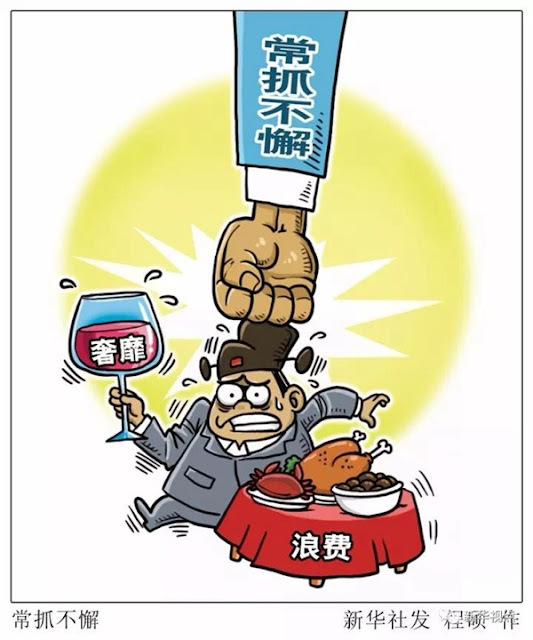 Typical cases of corruption in Nanjing have in the past year mostly involved food safety, remuneration for migrant workers, environmental pollution, and illegal mining—not the large-scale, high-profile problems with “tigers” that plague China’s upper echelons. Officials tend not to take bribes to get rich; they get paid to look the other way when local laws and regulations are being violated. Corruption here tends to be limited in scale, contained and somewhat constrained. That’s because, at least according to authorities, Nanjing has local advantages. As one account put it, “Nanjing’s red and traditional culture, as well as its humanities and historical resources, tell a story of honesty and goodness, and provide the foundation for party members to remain true to the government.” These psychological obstacles provide limits to large-scale corruption, they claim. There’s greed, but it doesn’t get out of hand. Plus, officials here claim, there’s a strong system of petitions and letters of complaint that encourage residents to report official malfeasance. Despite Nanjing's size (8 million or so citizens), everyone seems to know someone in the government and that means nothing stays very quiet very long. And yet there’s still graft in Nanjing—bribes being taken and some people using official positions to solicit them. The Party apparatus admits that, and these stories wouldn't be coming out if everyone was clean. Like a number of matters. Maybe Nanjing is right to aim at containing corruption, instead of aspiring to kill it off and claim a victory that would be fleeting at best. But look for Beijing to wonder whether that strategy is something worth investigating. The latter is an increasingly common indictment when highly-placed persons have used their position to indulge in graft of some sort, the parameters of which are still being sorted out. Some developers and officials insist privately that bribery is just the added cost of doing business in Nanjing. Others insist that was before Xi; that it's a different environment here these days.